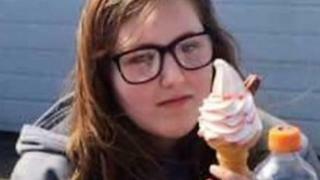 A 15-year-old girl died partly because of the "neglect" of two NHS trusts, an inquest has ruled. Becky Romero died in July shortly after being discharged from a secure mental health unit in Dorset. The coroner ruled the Bristol teen's death was "accidental" and "contributed to by the neglect of Avon and Wiltshire Mental Health Partnership (AWP) and Dorset HealthCare NHS trusts". AWP said it took the coroner's lengthy criticisms "extremely seriously". Dorset HealthCare NHS said it had "conducted our own investigation and are implementing a number of changes as a result of that". Following a suicide attempt, she was referred to the Pebble Lodge unit in Bournemouth. She was allowed a home visit and officially discharged days later, despite Becky and her family saying she was not ready to return home full time, the inquest heard. Becky was found dead on 19 July, less than a week after she returned home to Bedminster Down and just days after she had cut herself multiple times. "She had had three suicide attempts and was constantly self harming," her mother Nicola Romero said. "We were desperate, we knew we couldn't cope." Coroner Maria Voisin said there was insufficient evidence to show Becky intended to take her own life. She said the fact Becky had a history of self-harm meant it was more likely her death was the unintended consequence of her actions of self-harming. A spokesperson for AWP said: "We note the criticisms highlighted by the coroner and take them extremely seriously. "The trust will work closely with partner organisations to ensure greater communication and coordination going forwards."